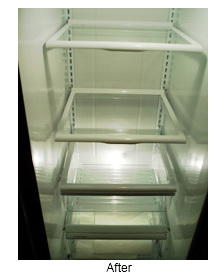 Refrigerator cleaning is an important step in maintaining a healthy home. The moist interiors of refrigerators, as well as freezers and coolers are a perfect breeding ground for mold and bacteria. When bacteria comes in contact with food, it may cause illness. 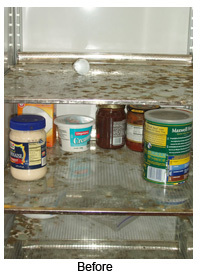 Hardened, spilled food and mildew can accumulate on the inside of your refrigerator, freezer or cooler which not only looks bad but could be bad for you. The Hygienic Home disinfects and sanitizes the complete interior of your appliance including all shelves and drawers using vapor steam to remove dirt and kill mold and bacteria that may come in contact with food.